Figures are really useful for explaining concepts like drift, however, I often find textbook figures are not super helpful. Pictures of hands reaching into jam jars of beans etc are useful metaphors but don’t really depict the process of transmission (also drift is sampling with replacement, so I’m never sure what process is really being depicted by a handful of beans). In addition it helps to be able to show multiple realizations of drift to show the randomness of drift, so multiple simulations help. 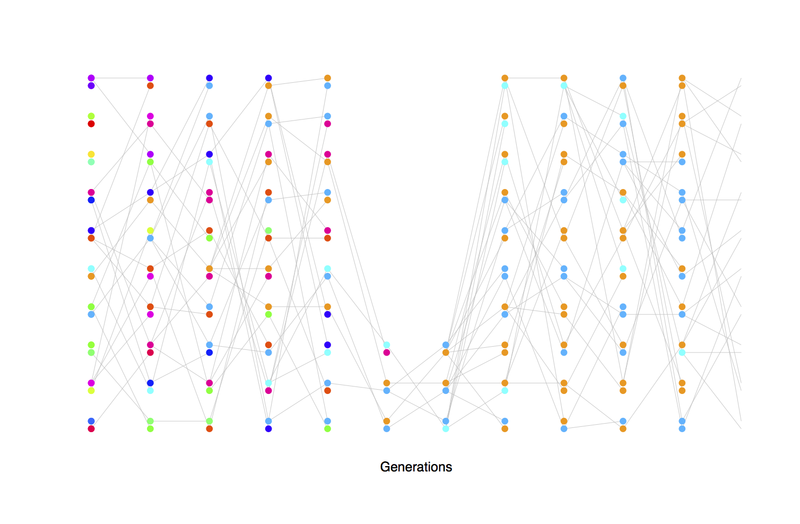 Dor my undergrad teaching this quarter I set myself the task of generating R code and figures to better depict drift in diploid populations. 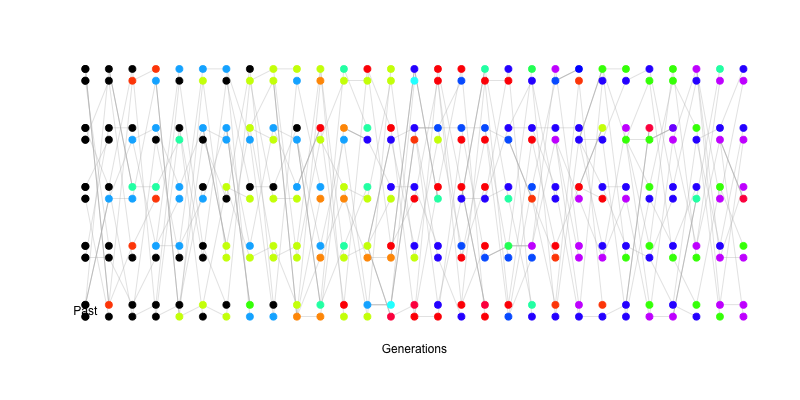 In these figures each generation is a vertical column, with each diploid individual having a two of alleles. All of the alleles are neutral with respect to each other. 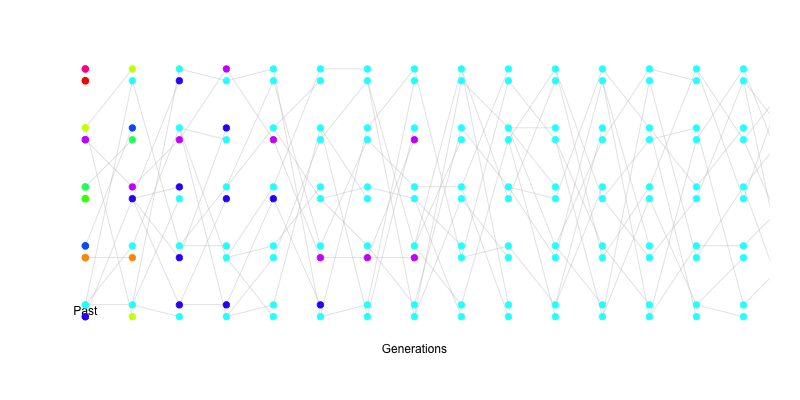 In each offspring generation, two random parents are chosen for each offspring, and one of each parents alleles are chosen at random. 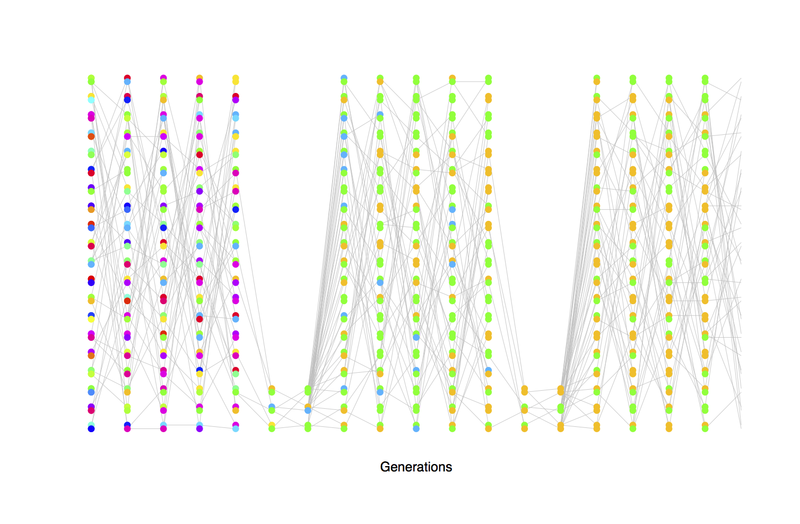 My R code to produce these figures, and ones like them is on github here. Feel free to reuse/repurpose the figures and code. If you find them useful leave a comment, or suggest ways they could be improved. 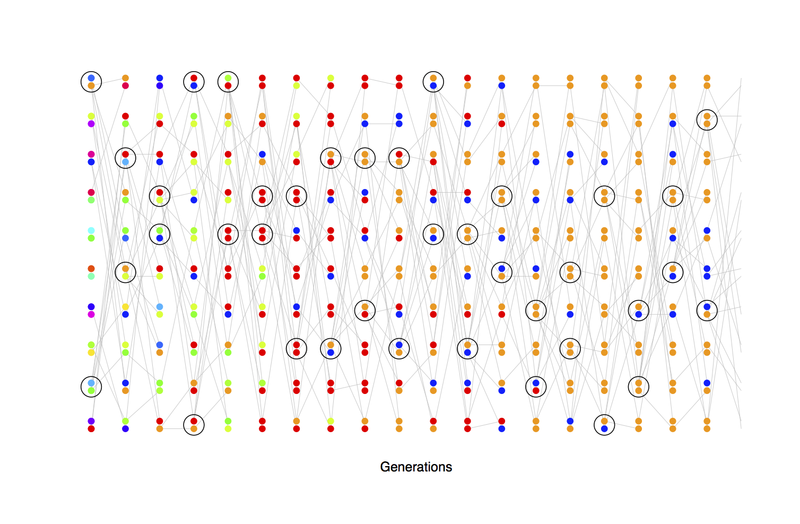 I’ve already started to integrate figures like them into my popgen notes [pdf here]. (in the figures below I use grey lines to show descent, but they don’t show up well on projectors in class, so I’ve included a link to a bunch more with black lines in a pdf below). 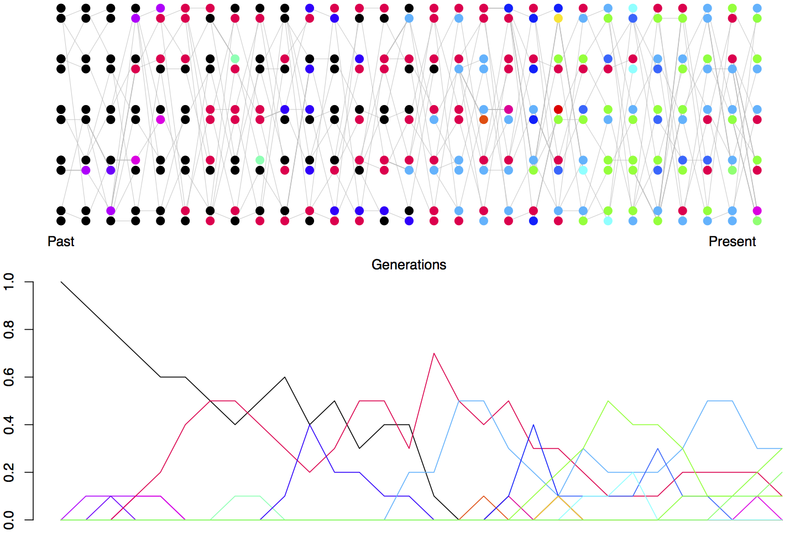 Genetic drift during bottlenecks leads to the rapid loss of genetic diveristy, particularly rare alleles, but can also by chance increase the frequency of rare alleles. Note that many newly mutated alleles drift into the population but are quickly lost. A bunch more simulations of these types are in this pdf. Trevor Bedford also has a nice set of simulation figures as well. These are great, Graham! Thanks for making them available and providing the R code. I just used a bunch in a guest lecture I gave in Scott Edwards’ Molecular Ecology and Evolution class and they were very helpful. Hi Tim. Great, glad they were useful! Feel free to suggest improvements. Will be hopefully updating them this quarter.